The cross product of two vectors results in a third vector which is perpendicular to the two input vectors. The result's magnitude is equal to the magnitudes of the two inputs multiplied together and then multiplied by the sine of the angle between the inputs. You can determine the direction of the result vector using the "left hand rule". 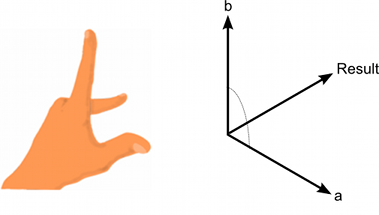 The left hand rule applied to Cross(a, b). // Get the normal to a triangle from the three corner points, a, b and c.
// Find vectors corresponding to two of the sides of the triangle. // Cross the vectors to get a perpendicular vector, then normalize it.